September has just flown by, hasn’t it? For some reason, I’ve been thinking about stripes a lot lately. But with September being as mild as it has been, I’ve worn my Bretons a few times recently, and was reminded: stripes are not just for Spring and Summer. They really are an all-year round thing – going to look at some of my favourite current stripy pieces in this post, and not just Breton tops! 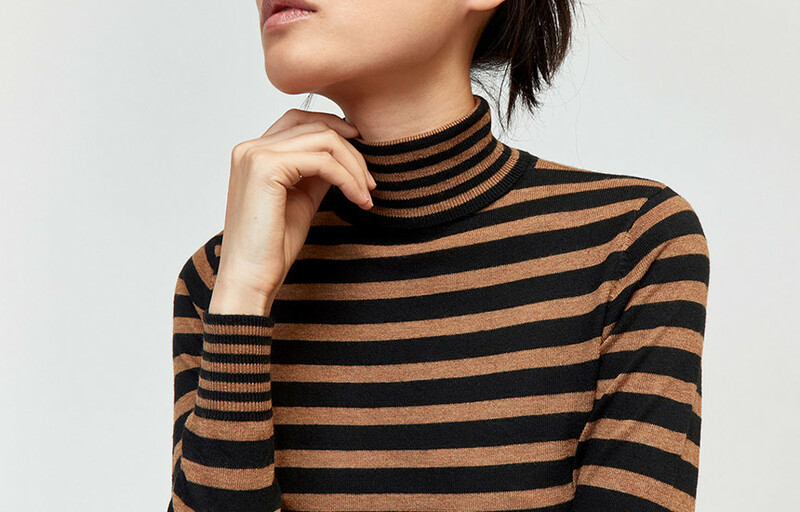 My absolute favourite type of winter layering top: a thin knit, polo neck. 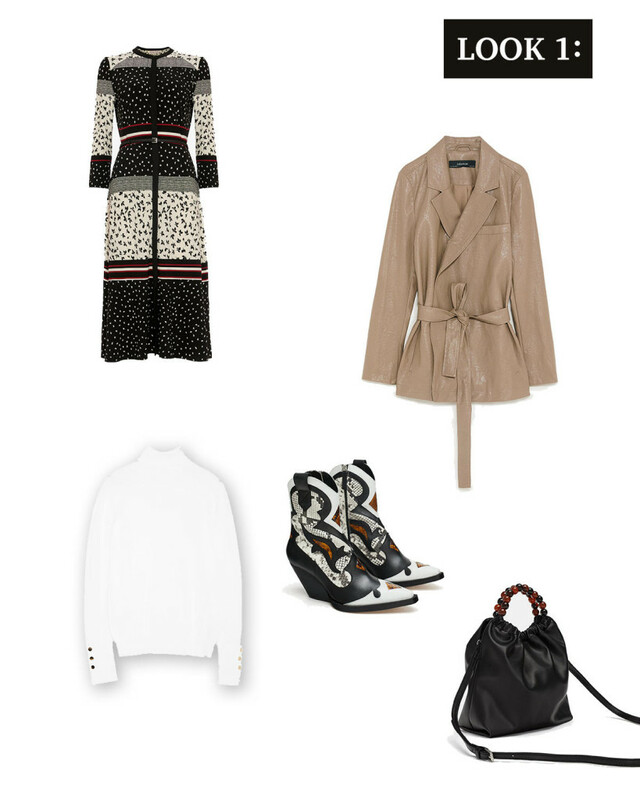 The camel and black stripes would work well in most of our wardrobes. 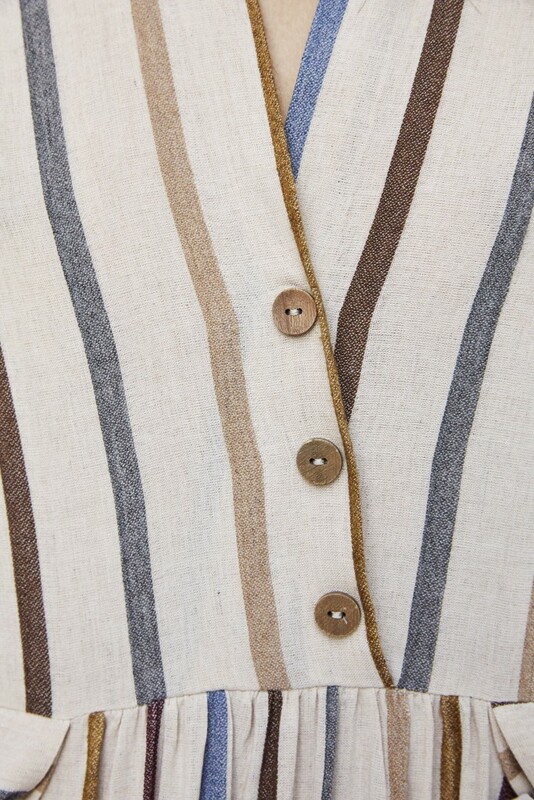 Check out the narrower stripes on the cuffs and neck – love it! Wear the knit on it’s own as per the Warehouse web photo, with a camel coat over the top. 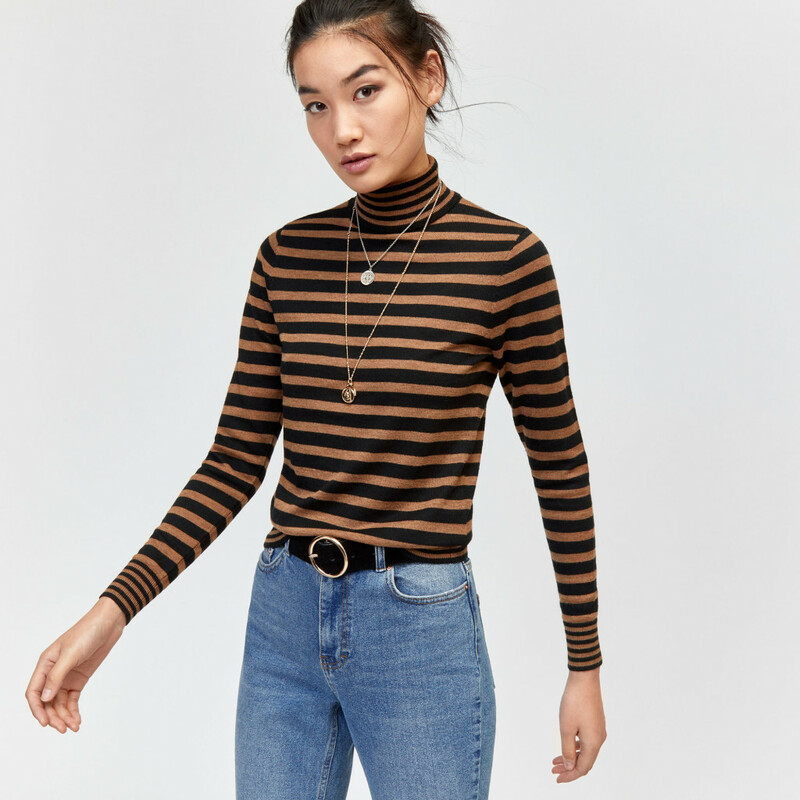 Or, layer under a shirt / dungarees… and indeed, if you’re into print clashing, I think these stripes would work quite nicely under certain florals or leopard print frocks as well. But I prefer a simple, non clashing layering. I’d wear mine under dungers or with a plain chunky knit over the top. If shades of brown and black are too muted for you, warehouse does have an alternative Rainbow stripe. I love the muted, autumnal stripes of this dress. Back in the days when my day to day life allowed for more dress wearing, I would have worn this with an off-white or brown heat tech polo neck underneath, knee high chocolate brown boots, and loose-knit cardi over the top. But the dress would work equally well with Navy blue tones. Sadly, with the smallest size being a size small, this is not one for us shorties… unless you have a whole bunch of alterations done. I guess this dress falls into ‘fantasy fashion’ for me: it’s lovely, I like it, but it doesn’t really fit in with my SAHM day to day. Had the dress been available in XS, it’s probably something I would have ordered… you know: just to see? This is out of budget for me at the moment, with all the little finishing touches to paint jobs around the house…. but it is a hug-in-a-knit. I’m sure there are cheaper versions of this sweater around… but I have a soft spot for Jigsaw knits, the quality is usually outstanding. 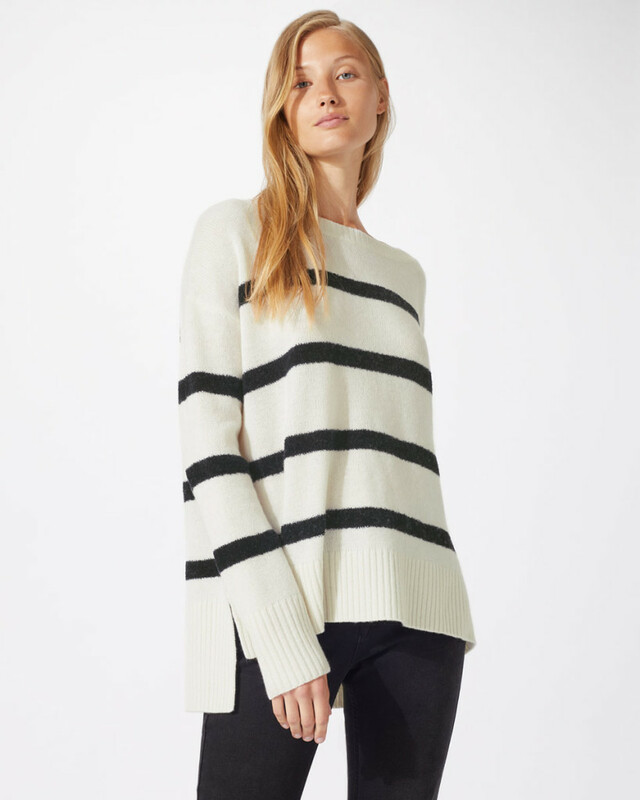 Crafted from a pure merino wool with a fluffy blend giving a textured raised design to the stripe, this slouchy knit is the ideal transitional piece to take you through to the cooler months. I’m quite partial to a jazzy sock. When I say ‘jazzy’, I pretty much mean stripy. I have a variety of stripy socks, from both ends of the budget spectrum, with my favourites being my Genevieve Sweeney socks. And although I love my GS socks – they are both super warm, and comfortable, they are a bit pricey in comparison to high street socks. So, my second favourite are bamboo socks. Yes – you read that correctly – bamboo! The bamboo element makes for a thin-knit sock, which is warm in winter and cooler in milder weather: basically as super breathable fibre. 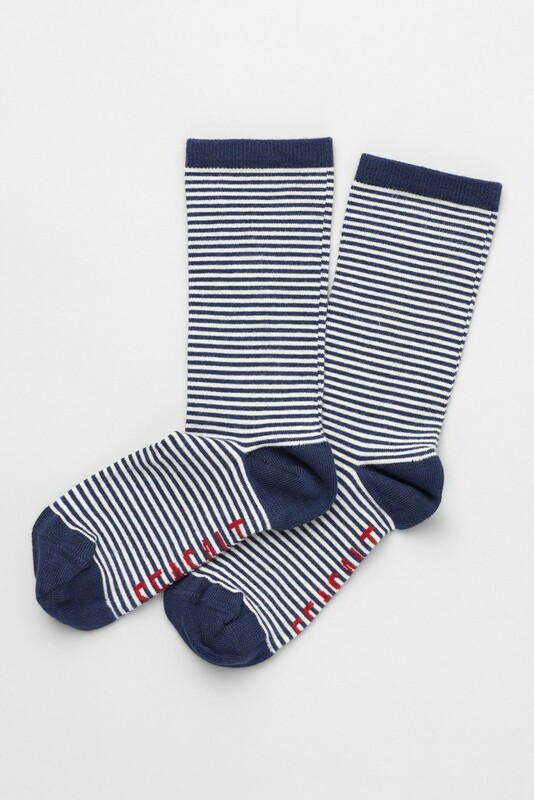 These Seasalt Sailor socks are available in a variety of colours, pretty good value at £6 a pair (considering how well they wash, and how long they’ll last you,) but they are even better value when considering you can buy 3-for-2. (oh and there’s a 20p charitable donation for each pair sold). 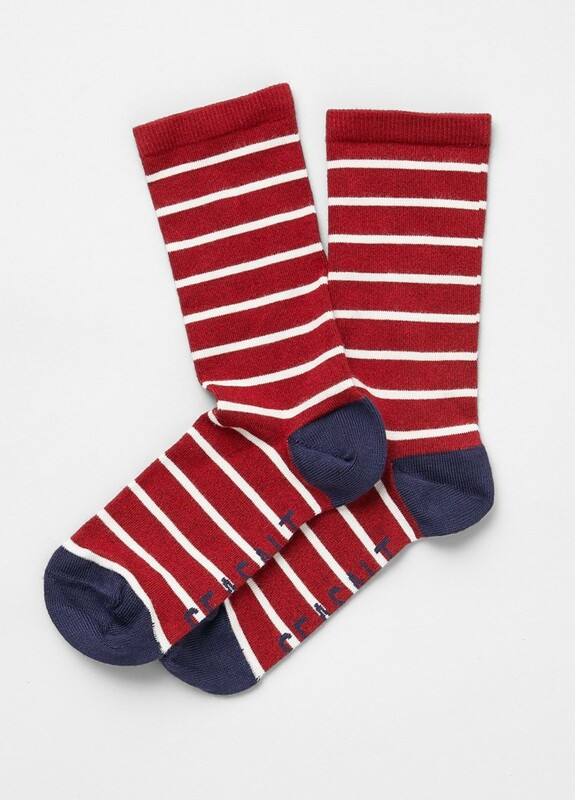 You only need to scan through the hundreds of positive reviews of these socks to know they really are good. 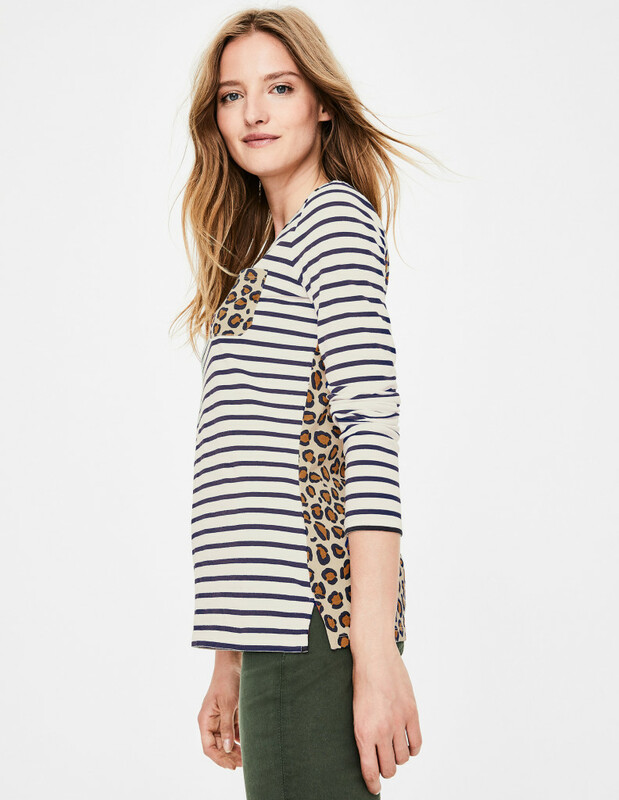 So… Boden have 14 different colour-ways and fancy-pants embellishments of their ‘standard’ breton… including this Leopard Print patch pocket/leopard print back Breton. I haven’t ordered a Boden Breton in like… 2 years or something?! Mainly because they changed the length (of body) and sleeves to be longer and they just don’t work for me. But they are good Bretons… and there’s usually some offer or deal to be had. And just to reiterate… I’ve been steering clear of Boden Breton’s in recent years simply because they’re not as great for petites as they once were. And price wise, yes, they have some excellent offers at certain times of the year, but a great alternative are smaller, indie brands (which often stock Bretons made from Organic Cotton). The Alex Edit Boutique and Hari & the Gang are two such indies, for starters. Classic pinstripes, paired with some classic white sneaks, and a chunky grey knit: outfit perfection! These Mango trousers do go down to a size 6, though I’d imagine they will need some taking up for us shorties. How cool is this styling from Mango though?! 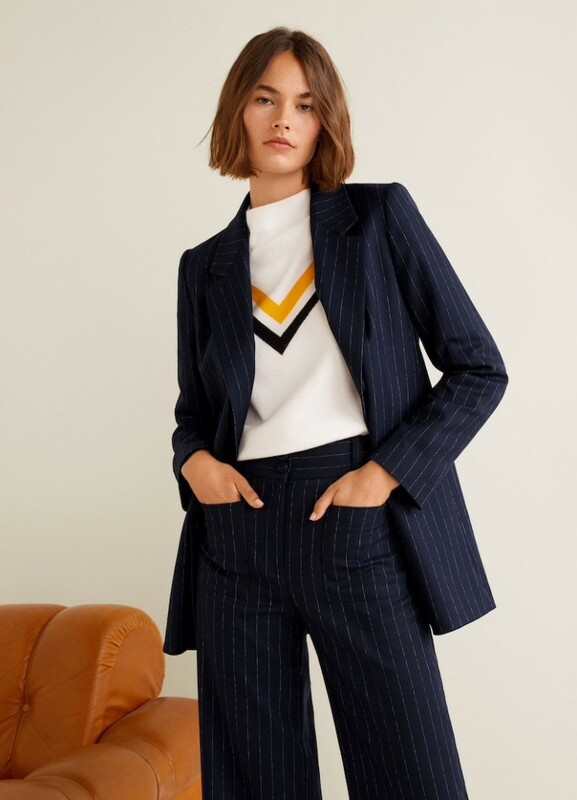 The full pinstriped suit with that knit… outfit love! I do love a good jumpsuit… and this striped one would be pretty good bet heading into the cooler months. Now obviously you can wear the jumpsuit as is, as per the web styling. But for the jumpsuit to work for me, I would definitely be layering with a boat/crew neck jersey top underneath. The jumpsuit has quite a plunging v, so you could almost layer it over a lace-edge-cami/shirt combo. 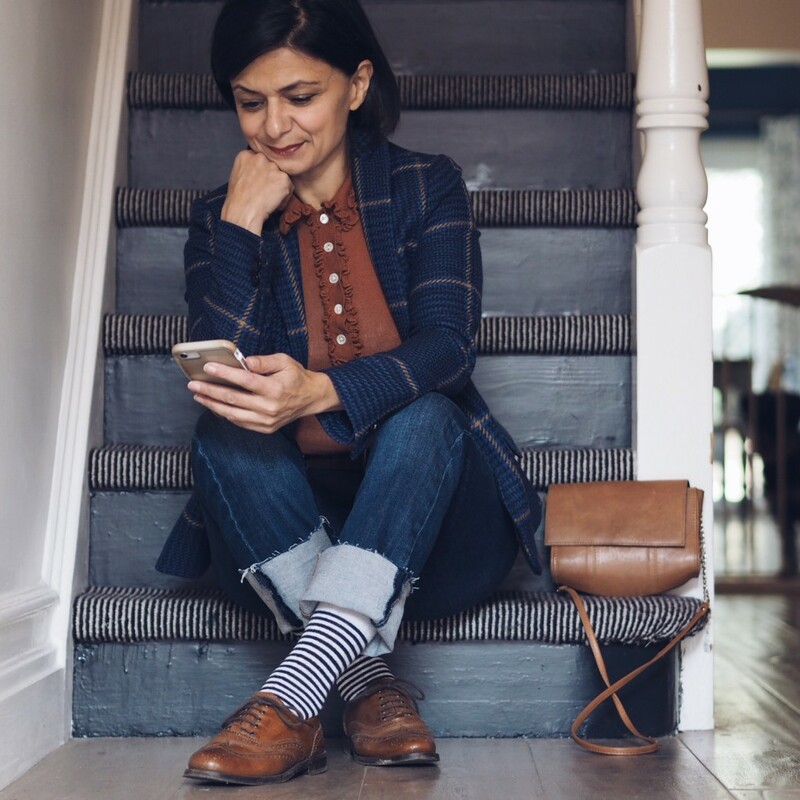 As mentioned in previous blog posts, I love a long-line, chunky cardi at this time of year and rather than putting the heating on all the time, when it’s not actually cold enough, I chuck my cardi over pretty much every outfit, whilst at home. And a long line cardi over this jumpsuit would be perfect. I’d stick to a socks & sneaks combo, or a longer line, mid-calf boot. And that’s it for my 7 this week: what do you think? I think I’ve opted for very muted, safe stripes…. but what can I tell you? I’ a muted-safe-stripe kind of girl! 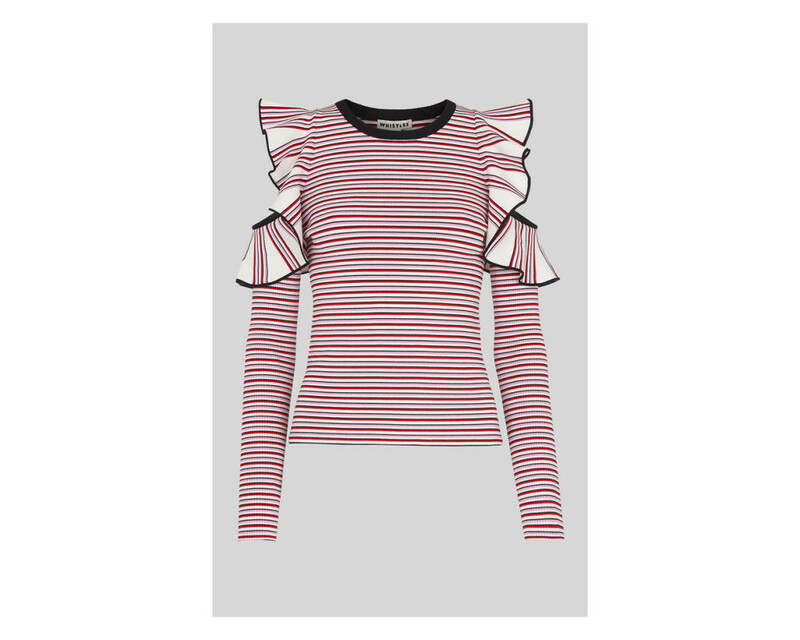 I love the colours of this knit but those frills? There are no photos of the knit on a model, but it looks like a cold-shoulder (or should that be ‘cold upper arms’?) kind of knit. I can imagine certain people completely rocking this knit. So… a frock with print: what’s going on, eh? … but I came across this dress on the John Lewis site, and given it *does* technically have stripes, albeit of the printed variety… it met the criteria for my wildcard brief. I’m drawn to the colours, the style, and indeed the delicate prints. But can I actually style the dress up to be more… well, more me?! There’s not much you can do with a dress really… or is there? 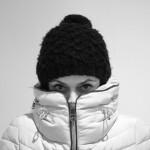 OK… you have the boots, and the dress… but being the eternally cold, little lizard that I am, I need my layers. 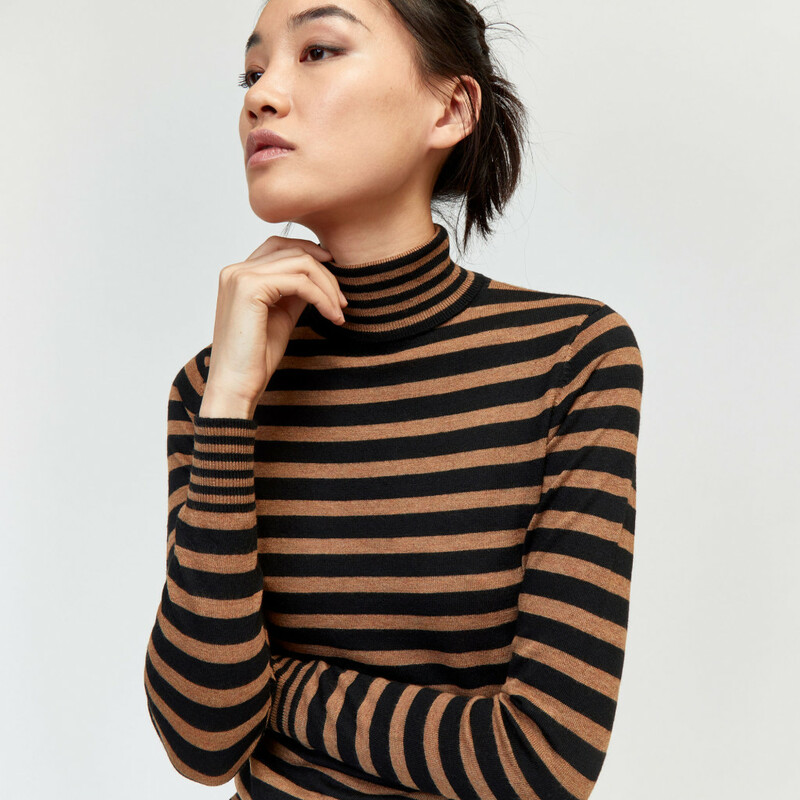 So I’d layer this Zara Basic Polo Neck Sweater (£19.99) under the dresss, which has 3/4 sleeves…. so the lovely button detail on the cuff of the polo neck sweater would peep through. I like the look of this cute little Bucket Bag with Round Handles (£29.99) which I’d either carry in my hand, or in the nook of my arm… bit like the Queen. 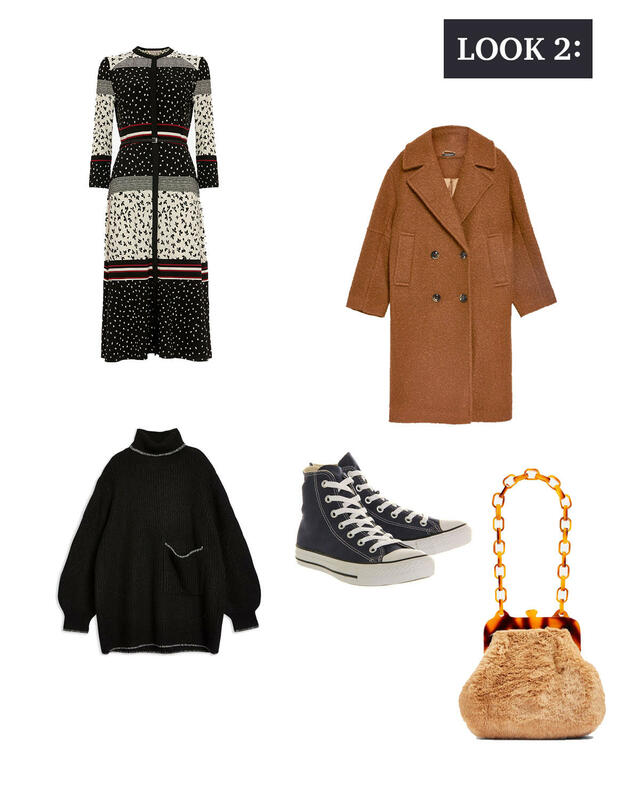 This is another basic bit of styling, but again, it’s a look which will mean you can make the most of your dresses when it really does get cold: chuck an over-sized knit over the dress and add trainers. Something like this Topshop Over-sized Tipped Roll Neck Sweater (£39) would work. And of course you could go with your bog standard favourite white trainers, but I’m currently having a bit of a love-in with my converse hi-tops, so these Black & White Converse (£47.99) would, to my mind, be ideal. This Boucle Coat (£79) would look lush over the knit & dress: all that fabulous texture together…. and perhaps room for a little more? In the form of this cute Tortoise Shell Frame Shoulder Bag (£25)… or just one texture too much?! And of course, how could I feature a dress without the old chestnut of Biker & boots combo? Again, I’d layer a thermal underneath, but this time, a crew neck John Lewis Heat Generating Ribbed Long Sleeve Thermal (£20) which I’ve opted for in a lovely plum colour to tie in with these beautiful Jigsaw Olsen Kitten Heel Ankle Boots (£175) which, yes, have a little kitten heel which I probably couldn’t walk in, but once I’d spotted them, I had to include: they’re gorgeous! 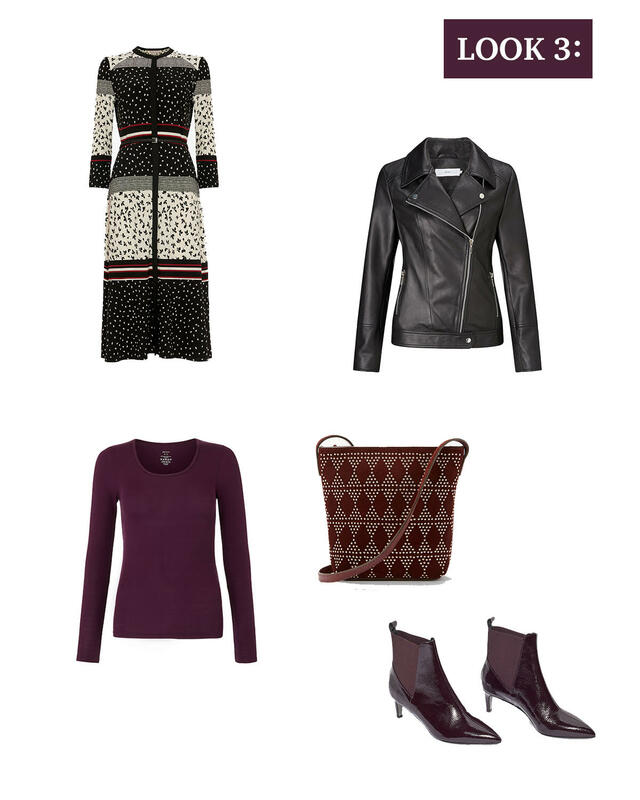 This simple, unfussy John Lewis Betsy Leather Biker Jacket (£199) over the top forms your failsafe ‘Biker, Boots & Midi Dress’ A/W look. 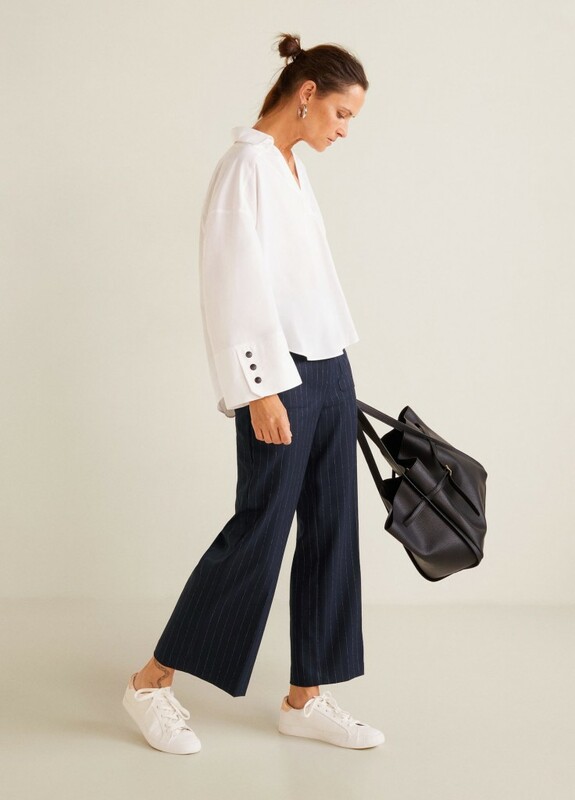 Just add this And/Or Mara Sued Small Zip Top Cross Body Bag (£49) – which I haven’t seen in real life, but it’s super cute, and a pretty good price as well! So that’s it from me this week. I’ve had a lovely weekend meeting up with some Instagram friends, both old and new, in my old home town of Bristol and old teen shopping fav, Bath… the weather was stunning, the company just great: which reminded me, I must stop being so lazy and get out and about some more! Hope you’ve enjoyed my 7 this week, and as always, I love hearing from you – my comments notifications are fixed: so leave a comment and I’ll get back to you. I so enjoy your blog and the way you manage to style things. I also really appreciate that you don’t have sponsored posts, I find them to be really boring and irritating although I appreciate that you would probably love to be sponsored and gifted things. Ah thank you, so good to hear! But yes, you’re right: I’d love to earn a little something every now and then, but fortunately for my readers (& unfortunately for my bank balance) mine is not a marketable look! Sooo good Bean! Once again you’re making me want to spend money….